a cell membranetransport mechanism that transports two molecules at once through the membrane in opposite directions. See also countertransport and symport. Antiport: sodium-calcium exchanger. 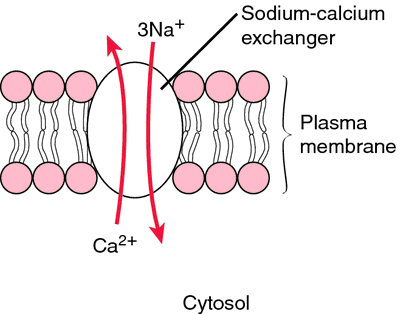 The electrochemical gradient of Na+ is used to pump Ca2+ out of the cell and thereby regulate the cytosolic Ca2+ level. The coupled transport of two different molecules or ions through a membrane in opposite directions by a common carrier mechanism (antiporter). Compare: symport, uniport. /an·ti·port/ (an´tĭ-port) a mechanism of coupling the transport of two compounds across a membrane in opposite directions. The coupled transport of two different molecules or ions through a membrane in opposite directions by a common carrier mechanism (antiporter). the transport of a SOLUTE across a MEMBRANE coupled to the transport of a different solute in the opposite direction. a cell membrane structure that transports two molecules at once through the membrane in opposite directions. SOS1 may be active as an antiport transporter and as ionic channel in the loading of xylem or even as a [Na. Role of Na+/H+ antiport in intracellular pH regulation by rabbit enterocytes. 12m layer for those treatments and, therefore, did not counteract the alkalinity of antiport uptake of leached N[O. Because of its redox instability, extracellular cysteine is mostly present in cystine, which can be transported into cells through cystine/glutamate antiport system [X.
antiport system may be coordinated with the increased activity of the v-type and pm-type [H.
drought , sequestration of heavy metals through metal-proton antiport systems  and chilling stress . 2001) is widely accepted due to its precise detections on the movement of plasma membrane (PM) H+-ATPase in the Na+/H+ antiport according to ion kinetics in response to salt shock. Impaired function of Na, K-ATPase, Na-H antiport, which is typical of arterial hypertension, may promote an increase in plasma electrolytes. Salt tolerance conferred by over expression of a vacuolar Na+/H+ antiport in Arabidopsis. antiport activity and its energization by the vacuolar [H.